Over the Christmas period I took a couple of weeks off from my healthy eating and fitness routine as bootcamp had finished and well it was just Christmas, the time for eating! Now that it's January I'm back in the fitness mindset and am all prepared to get my Summer body. I've recently downloaded a couple of new apps that will hopefully help me get there. Water Balance: I'm not the biggest fan of water as I much prefer orange squash but I'm trying to make a conscious effort to drink more as I know it's healthily for me and my skin. This apps monitors what you drink throughout the day and gives you an overall percentage at the end, it fluctuates during the day depending on what you drink eg. coffee and alcohol will bring you percentage down but water will bring it back up. Obviously the higher percentage the better. 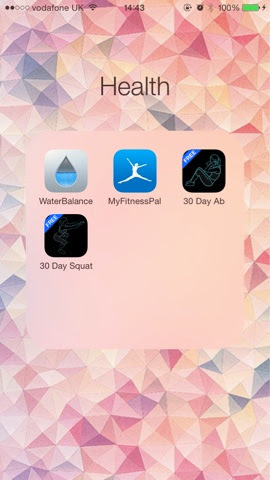 My Fitness Pal: This app keep track of what your calorie intake is for the day. I've never been one to count calories as that doesn't bother me but I think it's a good idea to keep a diary of what I've been eating so I know where I'm going wrong or what I did right on specific days. 30 Day Ab: This app is perfect for doing a little bit of exercise each day. There are 4 exercises, crunches, sit ups, leg raises and plank and the amount that you do of each varies from day to day. 30 Day Squat: This is the same as the 30 Day Ab except it's purely for squats and again the amount of squats you do varies each day. Do you use any of these apps? Are there any other apps that I need to download?